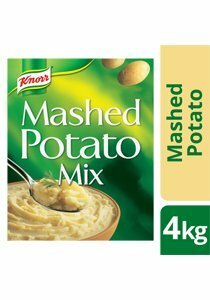 KNORR Superior Mashed Potato Mix creates an instant creamy, fresh tasting mashed potato. Made with real potatoes, KNORR Mashed Potato is ideal as a side dish for meat and vegetable dishes, or used as a cooking ingredient to top, coat, thicken or add extra flavour to meals. Bring the required quantity of water to the boil. Turn off heat, sprinkle in KNORR Superior Mashed Potato Mix and whisk until smooth. Serve or keep warm in a bain marie. Note: Add less water to create a firmer mash or extra water if a smoother mash is required. Servings per pack - 240. Serving size - 17.0 g (dry) makes 100 g mashed potato as consumed. To keep fresh seal foil bag tightly. Store in a cool, dry place.